The clients wanted to develop a live chat Android- and iOS-based application with features as live chat, sketch tools, images, animated emoticon and videos. Users should be able to add friends, update their profiles, block and report abuse. The client also wanted comprehensive parental controls to ensure child safety such as parents should have the ability to register, approve or block their kid’s friends request, permission access rule for camera and time slots for using the application. Based on the client’s business model, a number of prototypes were developed for the app taking in context the target market for kids and their interests. The developed application is a fun messaging app for kids with minimum yet critical parental controls. The kids can enjoy chatting with their friend’s, send text messages, voice messages, links and images to any other user. The application has also been provided with features like draw sketches, update profile with current status, solve puzzles, questionnaire and ask for answers. On 'Roo Kids', the parents own the contact list of the kids and can approve or reject a friend request and can setup curfew hours during which live messaging will not work. A very interesting feature of the application is that the app does not directly access the camera. Parents can restrict access to the iPad’s camera and there is no risk of accidental photo sharing. The application has garnered a committed and dedicated user base with a large number of downloads. The artwork and User Interface have been designed to appeal to kids. With increasing usage, the kids can then be moved away from less secure alternatives. It has one of the highest satisfaction rates among parents. 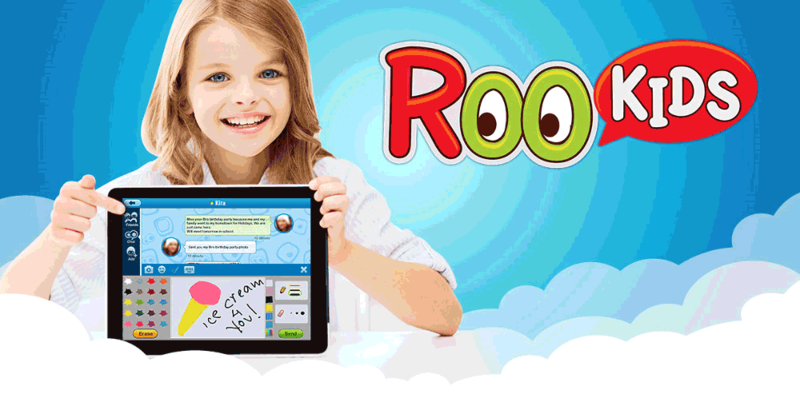 90% of customers consider ROO Kids Application helpful and useful to their kids in terms of general knowledge and communication skills. Kids and parents do not need to be tech savvy in order to use the features of the application. They all enjoy using it.